Now that I’m carrying Miss Mustard Seed’s Milk Paint and General Finishes Milk Paint in my space at Morgantown Market, I thought I’d take the time to help explain the features that each offers and help you decide which is the right product for your next project! Before I get started, I want to be upfront and state that this is not going to be a boxing match between MMSMP in one corner and GFMP in the other. These paints both have wonderful properties and are suited for all types of looks. One is not “better” than the other, and one isn’t “bad” while the other is “good”. The creators and companies that have developed these products have worked long and hard to bring them to the market, and I certainly will show them the utmost respect while I describe their features and characteristics to you, my readers. So if you’re looking for a critical review, this probably isn’t the one you want to read. I love both paint lines equally and for very different reasons! For this comparison, I’ll be breaking everything down by characteristic and will then describe the features of each paint product. Sound good? 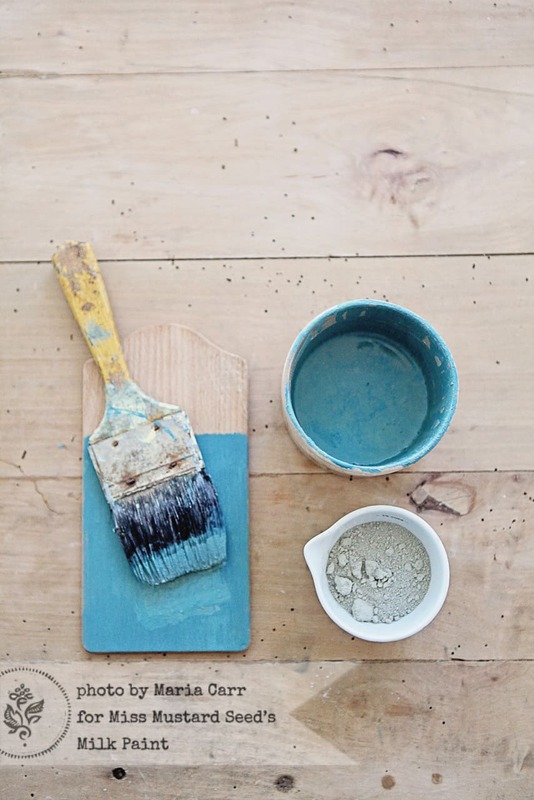 MMSMP – Miss Mustard Seed’s Milk Paint comes in powdered form. It is not pre-mixed and it is sold in pouches. There are tester sizes, quarts, and 2 quart bags available. 2 quart bags can be special ordered. This powder must be mixed with water to turn into a liquid paint. 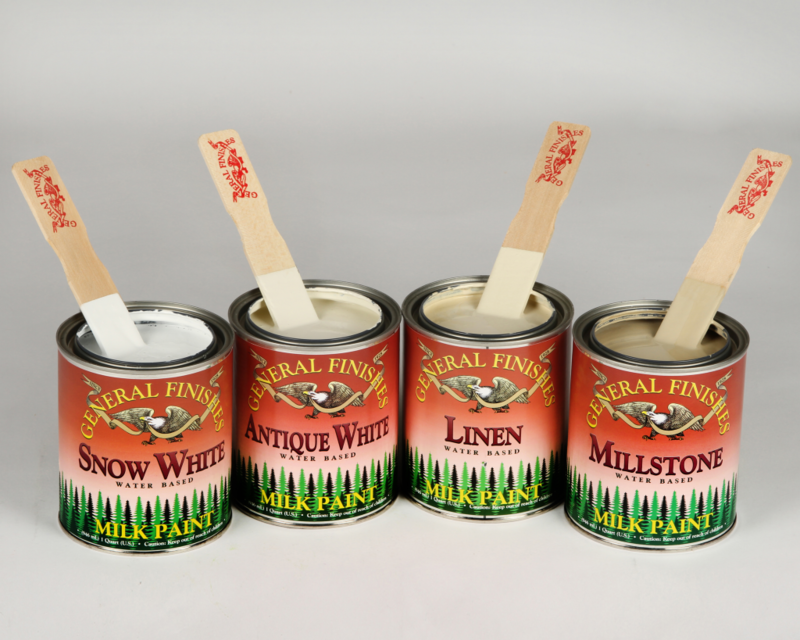 GFMP – General Finishes Milk Paint comes pre-mixed. It is a liquid paint that is sold in paint cans. There are pints, quarts, and gallons available. Gallons can be special ordered. Note that every brick-and-mortar retailer that sells these products is able to set their own pricing to suit their needs and their selling area. There will be a slight variation in the price you see online and from one retailer to the next. The prices below are what I am selling these products for at Morgantown Market. MMSMP is less expensive than other decorative paints on the market because it is sold in powder form. It costs less to ship and package, and its container is a pouch, which is marginally less expensive than a paint can. GFMP – Pints – $22. Quarts – $34. Gallons – $92. General Finishes is more expensive than MMSMP. A quart of GFMP is $10 more than a quart of MMSMP. This jump in price is for many reasons. First, it’s a heavier product to ship. It is a liquid paint that comes in a can, which weighs more per unit than a powder in a pouch. GFMP is shipped on a pallet via a freight trucking company, which costs more than being shipped in a box with packing peanuts via UPS. It is also more expensive because it is a modern paint product that has been specifically formulated for ease of use. That straight-from-the-can-convenience comes at a price. 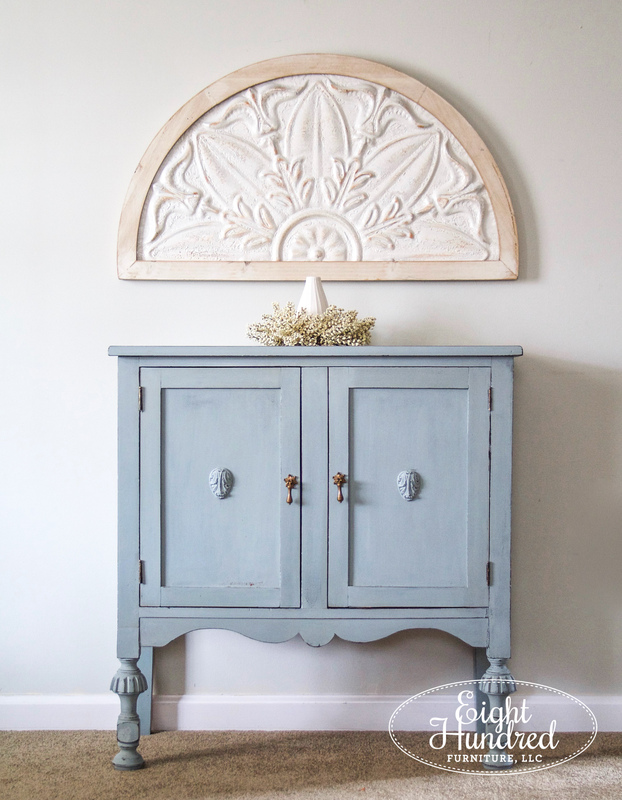 MMSMP – Miss Mustard Seed’s Milk Paint is a very simple, basic, and natural paint product. (Please note that it is not all natural, as some of the pigments needed to create the colors are not naturally occurring. The majority of the products though are natural.) It contains five simple ingredients. Chalk gives it a lovely matte texture and shine. Clay is odor absorbing. Limestone dries hard and provides durability. The pigments provide gorgeous color. Powdered Milk Protein (called casein) give MMSMP its creamy texture and puts the “milk” in Milk Paint! 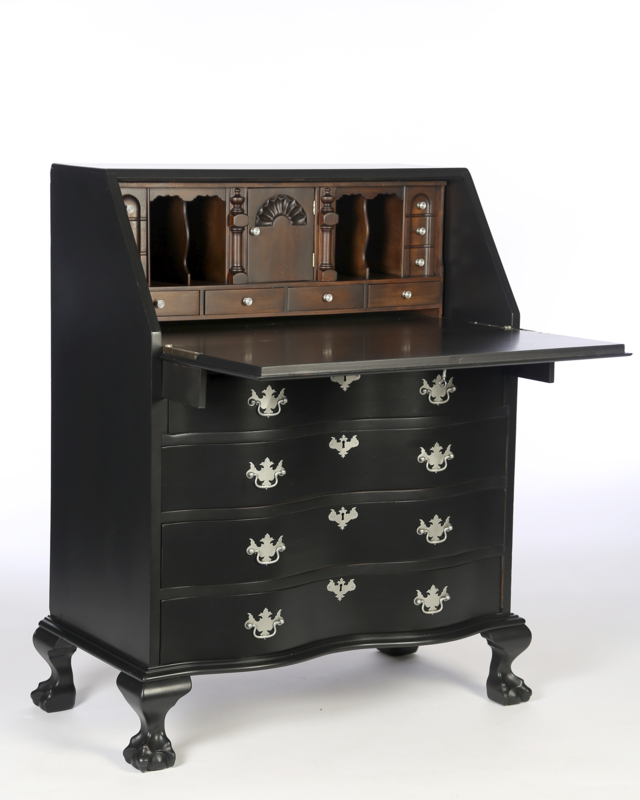 MMSMP is a true old world style powdered Milk Paint product. GFMP – General Finishes Milk Paint is not a true casein-based Milk Paint like MMSMP. Rather, it is a modern pre-mixed liquid paint that has an acrylic base. It was given the name “milk paint” because it simulates the low luster of true casein-based Milk Paint. GF’s wanted to create a paint product to do homage to that old world paint tradition, and their version of Milk Paint is the result! 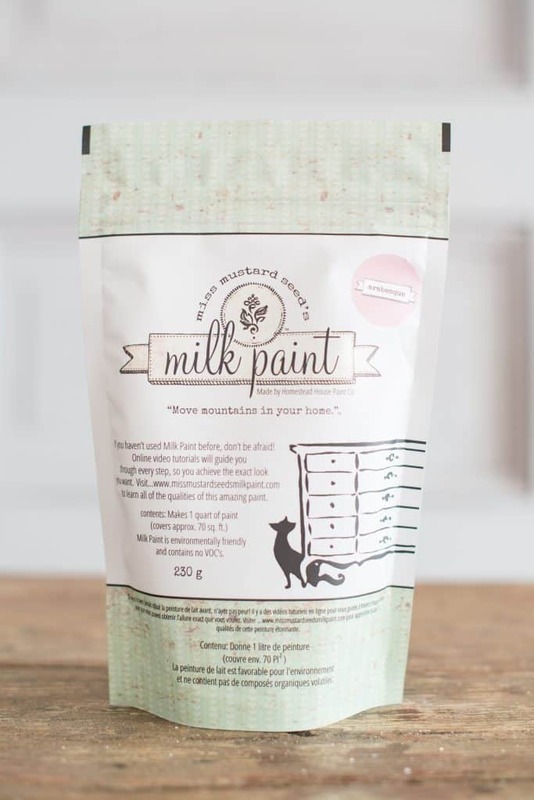 MMSMP – Miss Mustard Seed’s Milk Paint is made by Homestead House in Toronto, Canada. 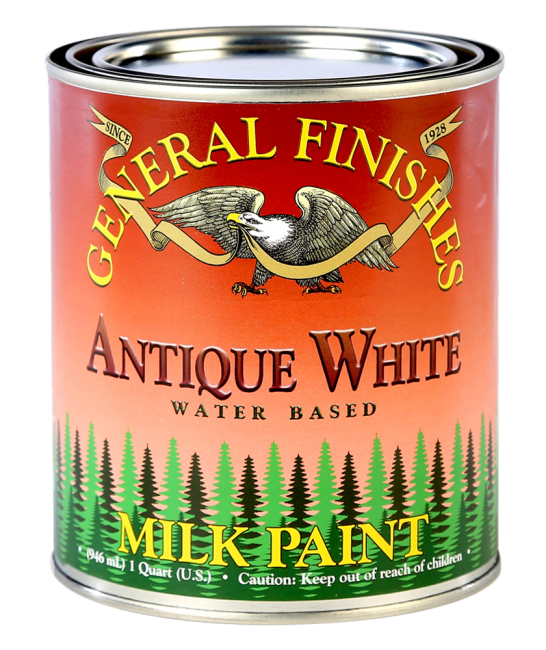 GFMP – General Finishes Milk Paint is made in the USA. 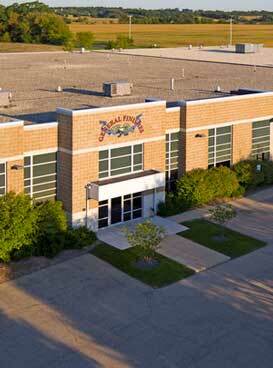 It is manufactured and shipped from their plant in East Troy, Wisconsin. MMSMP – Miss Mustard Seed’s Milk Paint is a thin paint that has the consistency of melted ice cream. It is much thinner than modern paints, but the thickness can be changed by adding powder or water. 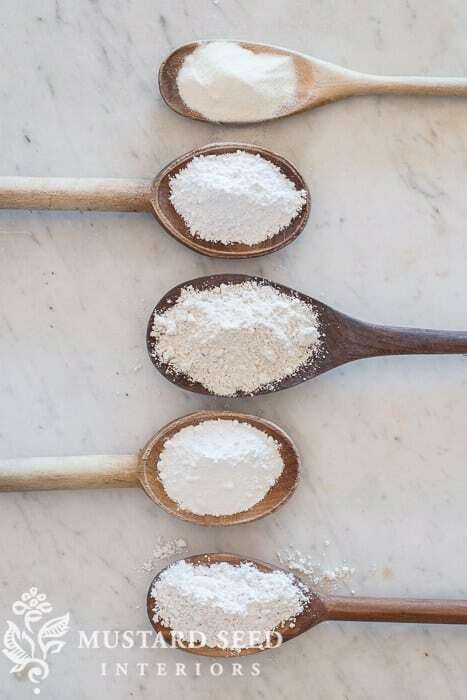 Mix it thin to act as a wash or a wood stain. Mix it thick to add texture and age to a piece. GFMP – General Finishes Milk Paint is a full-bodied paint that has the consistency you would expect from a modern paint. It can be thinned with water to use as a wash, but it cannot be thickened to create texture. 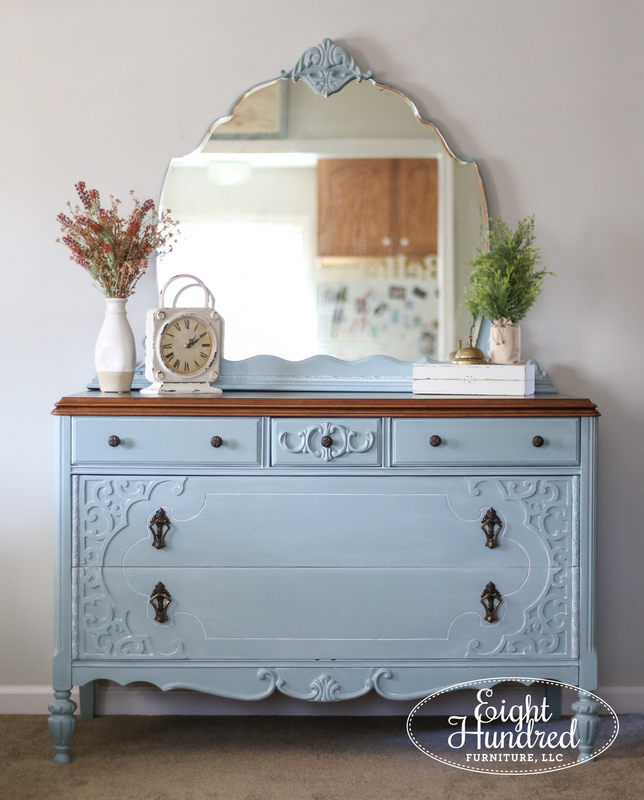 MMSMP – Miss Mustard Seed’s Milk Paint has no shine whatsoever. This paint is flat and matte. The only shine that can be created is from the use of Furniture Wax, which can be buffed out to a low luster shine. Even the Tough Coat water based topcoat does not contain any shine. GFMP – General Finishes Milk Paint naturally has a low luster shine somewhere between a Flat and Satin sheen. Additional shine can be built by applying High Performance Topcoat in Satin, Semi Gloss, or Gloss. If a Flat look is desired, High Performance also comes in Flat. MMSMP – Miss Mustard Seed’s Milk Paint adheres beautifully to raw wood projects because it soaks in more like a stain rather than laying on the top. It by far the best paint product to preserve and maintain wood grain while providing gorgeous color. It does require prep work to adhere to smooth, glossy, and shiny surfaces. By cleaning and scuffing these surfaces, adhesion is greatly improved. MMSMP also resists these surfaces and may naturally chip and flake off. This look can be quite charming! The use of an additive called Bonding Agent is required to achieve a full coverage look with no chipping on surfaces that are not raw wood. MMSMP is unpredictable in the amount, location, and severity of chipping. GFMP – General Finishes Milk Paint has excellent adhesive properties. Surfaces should still be properly prepped by cleaning and lightly scuffing with 400 grit sandpaper. Watch this video to learn how to properly clean and prep sand a piece that has an existing finish. As you can see, the prep sanding is not nearly as intense on surfaces that already have an existing finish or are slightly glossy when compared to MMSMP. GFMP is predictable and only chips when the finish has failed (typically due to improper prep or inadequate dry time in between coats). 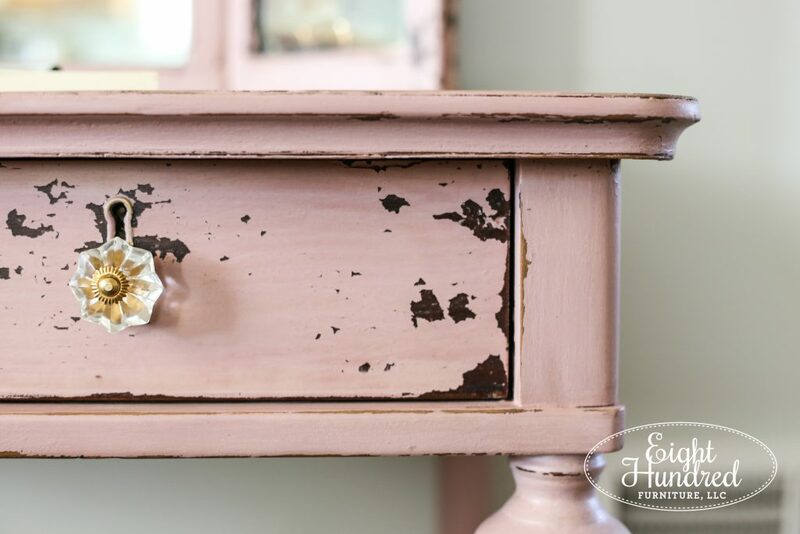 MMSMP – Miss Mustard Seed’s Milk Paint distresses beautifully with sandpaper. Distressing can be done in a linear fashion along high points and edges, or in chipped patches with a putty knife. The random chipping of MMSMP provides natural distressing and an authentically aged finish. 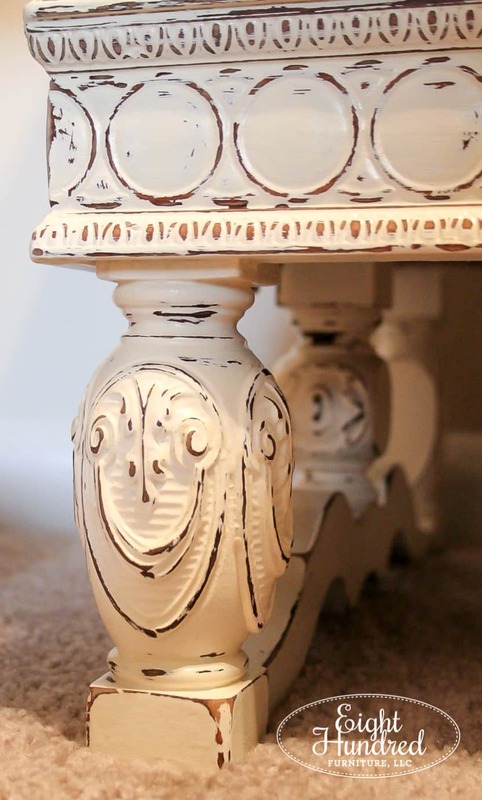 GFMP – General Finishes Milk Paint can be distressed with sandpaper if desired. It does not naturally chip. 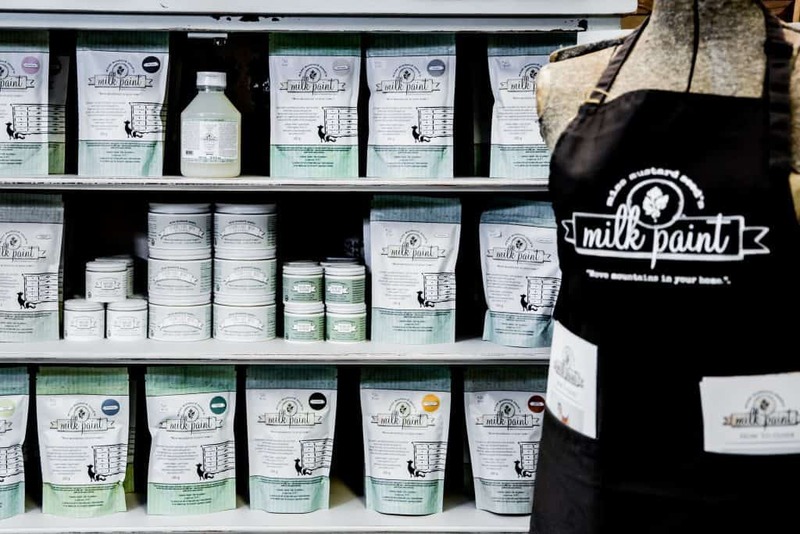 MMSMP – Miss Mustard Seed’s Milk Paint is not recommended for kitchens. This unique environment requires a product with high levels of adhesion, and unless cabinets are raw wood with no existing finish, it’s best used on other surfaces in your home. GFMP – General Finishes Milk Paint works well on kitchen cabinets. Proper preparation techniques are required. Watch this video to see how to do a “power clean” on high use surfaces, and to see how you can use GF products to update kitchen cabinets with a light paint color. Please take note that painting kitchen cabinets is not like painting a piece of furniture. Cabinets are exposed to oil, grease, heat, and water and proper preparation is required for a durable and long-lasting finish. Patience is a MUST, and this is not a project that should be rushed or taken lightly! MMSMP – Miss Mustard Seed’s Milk Paint should be protected with the use of one of the various topcoats in the line. Options include Hemp Oil, Waxes, and Tough Coat. GFMP – General Finishes Milk Paint is self-sealing and does not require a topcoat on low to medium wear surfaces. If additional protection is needed, or a different shine is desired, the recommended topcoat is High Performance water based topcoat. It comes in Flat, Satin, Semi Gloss, or High Gloss sheens. Both paint products cure in 20-30 days, which is the industry standard. You may use your project once dry, but be gentle and do not place anything heavy or scratchy on top. Do not subject your project to heavy use, water, or heat during this window of time. Always practice basic furniture care procedures i.e. coasters, trivets, and hot plates. Never place sweating drinks, hot beverages, or hot pots directly on a painted or stained surface, as this will result in water rings and heat marks. MMSMP – Miss Mustard Seed’s Milk Paint contains no voc’s (volatile organic compounds). It is safe to use indoors and is an eco-friendly product. It does smell a bit like wet soil, which is due to the clay and chalk ingredients. GFMP – General Finishes Milk Paint is a low voc product. It is safe to use indoors. MMSMP – Miss Mustard Seed’s Milk Paint can be used outside when sealed with an exterior-grade sealer, such as Tung Oil. The topcoats in the MMSMP collection are not meant to be used outside. 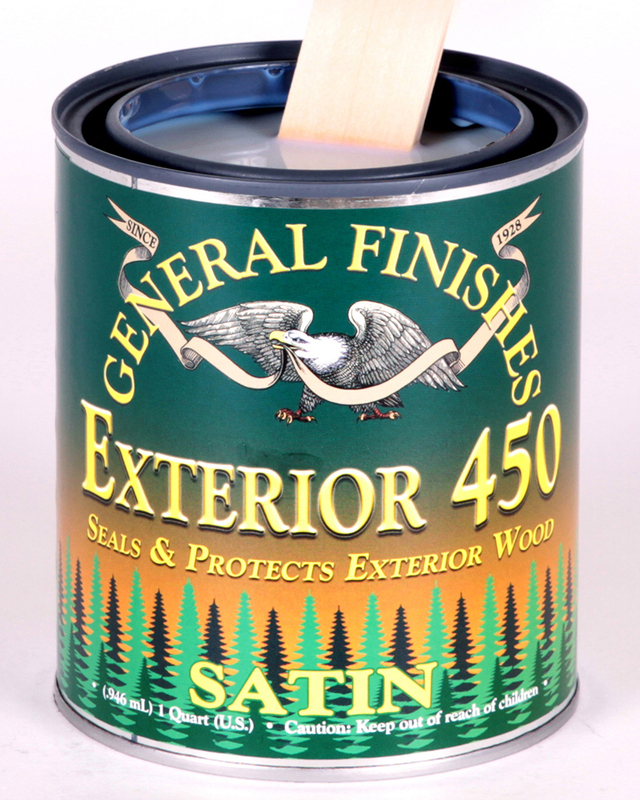 You can purchase Tung Oil from your local hardware store, or use General Finishes Exterior 450 (see below). GFMP – General Finishes Milk Paint is an exterior rated paint. It can be used outdoors and it’s recommended to use Exterior 450 topcoat on pieces that will have heavy exposure to the elements. 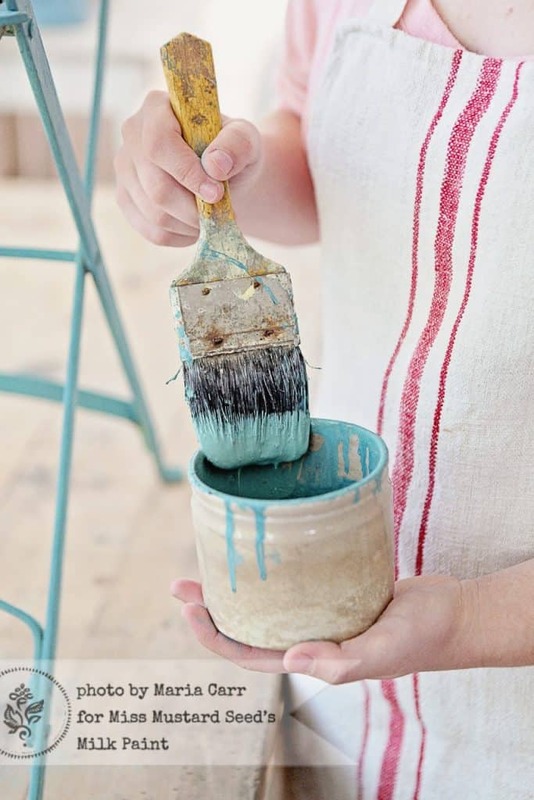 MMSMP – Miss Mustard Seed’s Milk Paint can be put through a paint sprayer, but it must be run through a fine sieve to remove any sediment prior to spraying. 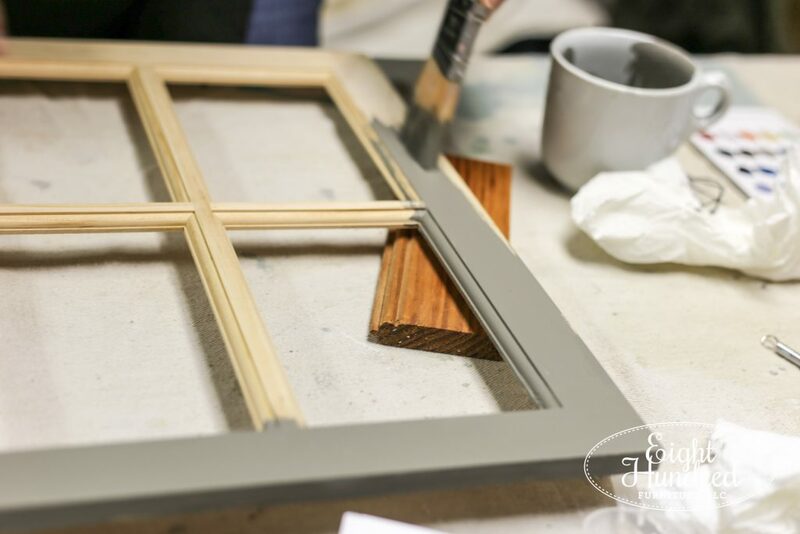 GFMP – General Finishes Milk Paint sprays beautifully. 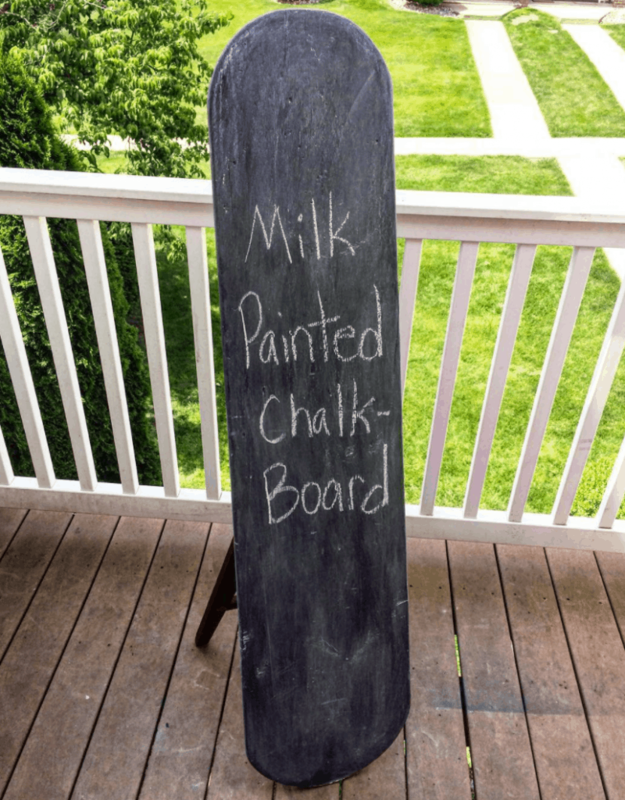 MMSMP – Miss Mustard Seed’s Milk Paint can be used to create chalkboards! Use Typewriter for a traditional black canvas, or use The Golden Sycamore‘s “Vintage Chalkboard Mix” to create a vintage green. The recipe is 3 parts Boxwood and 2 parts Artissimo. Paint on 2 coats and do NOT seal. Rub with chalk to season the surface. Wipe off and enjoy! 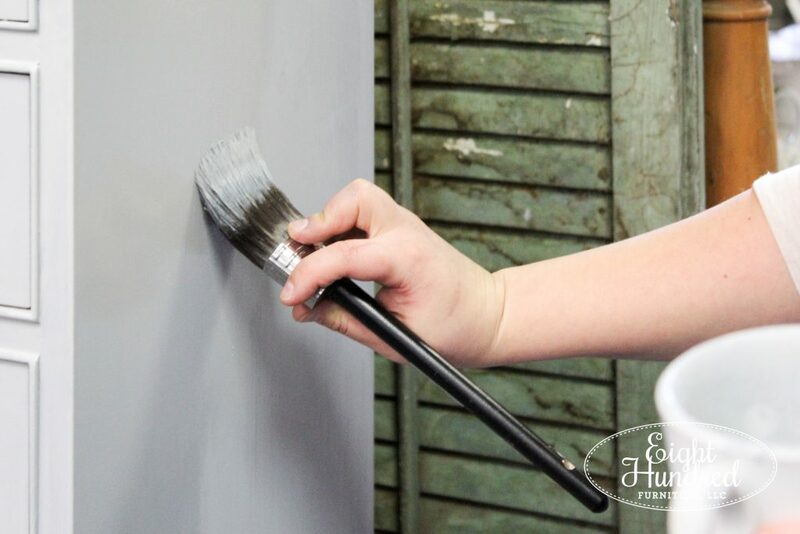 GFMP – General Finishes Milk Paint is not recommended for making chalkboards. GFMP – General Finishes Milk Paint is also self-leveling and does not show brush strokes. Because it is a thicker paint, care should be taken to smooth out the paint as it is applied. You should follow the lines or grain of your piece while painting. GFMP is formulated to set up quickly, so make sure not to over-brush the product. It is not meant to be spread like chalk style paints. Put it on, smooth it out, and let it do its thing! 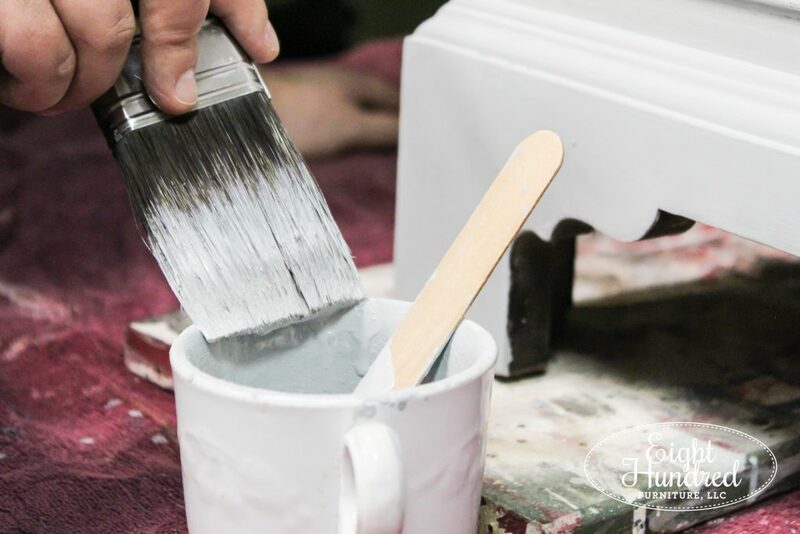 MMSMP – Miss Mustard Seed’s Milk Paint is the ideal choice to use on pieces that are raw wood or have a very worn finish. It can be a full coverage paint the closer the surface is to raw wood. It provides a charming authentically aged finish on surfaces that have a pre-existing finish. It chips randomly and has natural variations in the paint color. It is flat with no shine and is ideal if you want to achieve an old world look. It can be a bit unpredictable by nature, so it’s best to have an open mind when working with this primitive style of paint. 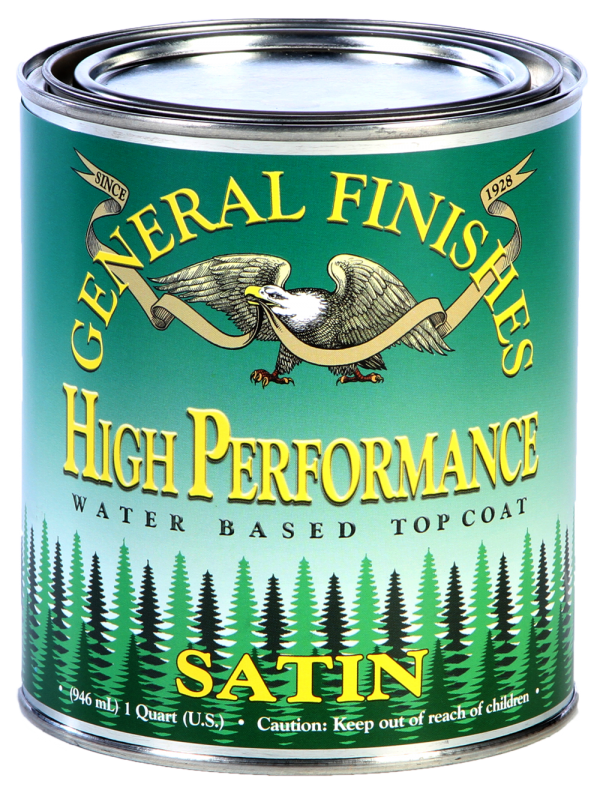 GFMP – General Finishes Milk Paint is a full coverage paint that does not chip or flake. It is consistent in its color and does not contain any variations. It is ideal to use for a full coverage modern look. It can be distressed with sandpaper, but it will not do the “chippy look”. It provides an even painted surface all the way around your piece. It behaves in a very predictable manner when applied over a surface that has been properly prepared. It has a natural low luster sheen that falls somewhere between a flat and a satin. I hope this comparison helped to explain the differences and similarities of Miss Mustard Seed’s Milk Paint and General Finishes Milk Paint. It’s best to actually see pieces painted in each and to watch demonstrations to learn how each is applied. Come visit my booth at Morgantown Market and see pieces in person. Check my website and social media feeds to see when I’ll be hosting my next demonstration/workshops with each of these products. Finally, the best way to learn about the differences between these two lines is the actually use them! Shop for MMSMP and GFMP in my booth at Morgantown Market. I’d be happy to advise you and steer you towards the right products for your next project! 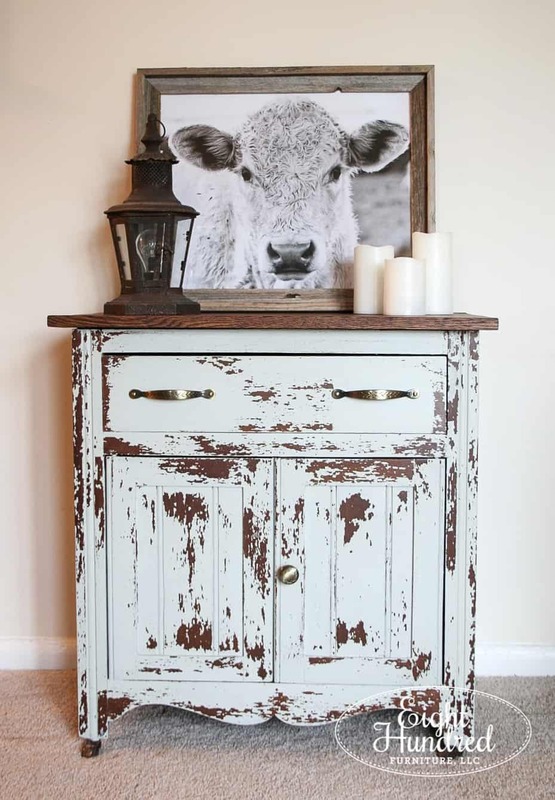 Previous Post: « What is General Finishes Milk Paint?